See all The Fountains - for sale. See all The Fountains - sold. 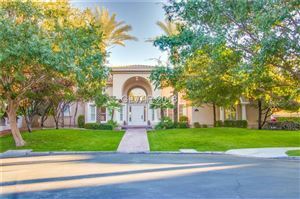 The Fountains is considered one of the most affluent neighborhoods in Green Valley, an established Henderson master-planned community known for its premier residential neighborhoods. This community is a traditionally elegant and secluded, 24-hour guard gated enclave of about 196 estate-worthy, custom homes, all beautifully landscaped. Near the entrance is a grassy park for all residents to enjoy. Mature landscaping provides privacy as you enjoy the basketball, tennis, and shuffleboard courts, and the “Tot Lot,” a colorfully equipped play area for the little ones. Life at The Fountains puts the very best of amenities at your fingertips, from beautiful walking trails to outstanding parks, recreation facilities and an aquatic center for family fun. Nearby, there are award-winning golf courses, an impressive array of gourmet restaurants, shops and retail services for anything you may want or need. Every part of the Las Vegas Valley is easily accessible from The Fountains. McCarran International Airport and the Las Vegas Strip are each about twenty minutes away, while the Hoover Dam and Lake Mead are only about thirty minutes from your door. Henderson is one of the best places to live in the country, offering comfort, convenience, diversity, and some of the best schools in Clark County. The city of Henderson is ranked one of the top 5 safest cities nationwide and the second fastest growing city in Nevada.